Does the idea of a college-level income, without the college-level cost, interest you? Do you want the flexibility of working from home, consider yourself good with language, and like a good challenge? Do legal topics interest you? If so, you may want to consider building a career as a scopist. See if this Internet Scoping School review helps you decide whether or not to consider it. Maybe you’ve heard of scoping, but aren’t quite sure what it is. Or maybe you’ve never heard of it at all. You’re definitely not alone. It’s the work-from-home career most have never heard of! But don’t worry; it’s still an option to consider. So what exactly is scoping? Scoping is basically editing legal transcripts for court reporters. During legal proceedings court reporters type what they hear on a steno writer and use computer software to transcribe these steno notes. The scopist receives this transcript and the audio from the court reporter and edits the transcript to exactly match the audio. Simple as that may sound, there are a number of skills required to get the job done. Internet Scoping School teaches everything you need to know to become a successful scopist, even without any prior knowledge. Internet Scoping School provides in-depth, self-paced training covering a wide range of topics related to scoping, from the basics to more advanced concepts and skills. Over the years, the course has been updated, but the core remains the same. In the fall of 2016, Internet Scoping School launched on a new site – the new website is very user-friendly and loaded with information about the training program and the career. Now, you will not only benefit from Linda’s 40+ years of scoping experience through web-based training modules, but you also have lifetime access to a supportive network via the accompanying private Facebook group. Internet Scoping School is an intensive, online course that teaches the skills needed to build a professional career as a scopist. Those without any previous knowledge of court reporting, scoping, or the legal field can get started with the Scoping Fundamentals module, which can be purchased separately; once it’s successfully completed, students can purchase the remaining seven modules of Internet Scoping School. All the modules are broken down into short lessons, most of which are task-based. The remaining modules include the specialized information you need to know to perform the job of a scopist, from training in relevant software and skills to additional tips for running a successful scoping business. The course is designed so that students are fully equipped to take on their first client as soon as they complete the course. Each lesson concludes with a self-graded quiz and then each module concludes with a final exam, hand-graded partially or completely by Linda, depending on the subject matter. The last task in the course is to edit a transcript according to a reporter’s preferences, just like in real life. This course is for individuals who want to have a professional work-from-home career and are willing to invest in longer-term training. It’s great for moms who want the option to be home with sick kids or to attend field trips and appointments, individuals ready to retire from a cubicle or a commute, or someone with health concerns wanting to work on their own schedule, taking on as little or as much work as they want. Linda has created a comprehensive course that covers the skills needed to be a scopist along with how to market your business and additional, practical business tips. Through the course, Linda freely shares her knowledge from 35 years of working as a scopist. For newbies to the field, the course begins with Scoping Fundamentals, which is an introduction to scoping and lessons on word usage mistakes. It is purchased separately from Internet Scoping School and ends with a test. After taking Scoping Fundamentals, you should understand what a court reporter does and how steno works. You will be familiar with transcripts, formatting, vocabulary specific to the field, common errors, and more. It’ll give a good idea if you have the foundational skills needed to be a scopist, and if you even think you will enjoy this career path. Following successful completion of Scoping Fundamentals, there are seven remaining sections of Internet Scoping School that dig deeper. Using training videos, downloadable workbooks, answer keys and worksheets, along with interactive quizzes, practice transcripts, an online support forum, and bonus reference ebooks, an extensive amount of material is covered. Additional resources to be purchased by the student are Morson’s English Guide for Court Reporters and A Court Reporter’s Guide to Medical Terminology. Case CATalyst 4+ Software is also needed, but doesn’t have to be purchased before enrolling in the course and ISS students receive a discount on this software. The Internet Scoping School syllabus provides detailed information about each module and the course objectives. You can also check out Linda’s free training or the public Facebook group for more information about scoping. Video Clips: ISS is currently in the process of adding video clips to the training to demonstrate some of the concepts that are difficult for students to grasp when just reading instructions. 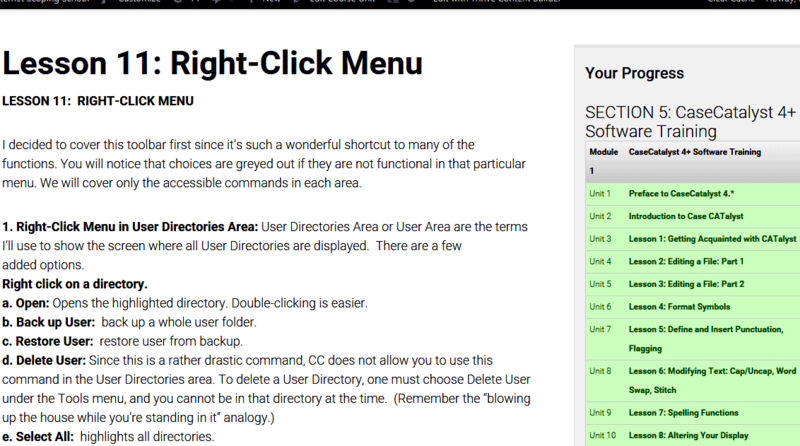 The videos will make it much easier to understand and replicate software commands. New Lesson: In Version 20 of the Case CATalyst software, a new real-time methodology called RealTeam has been added. 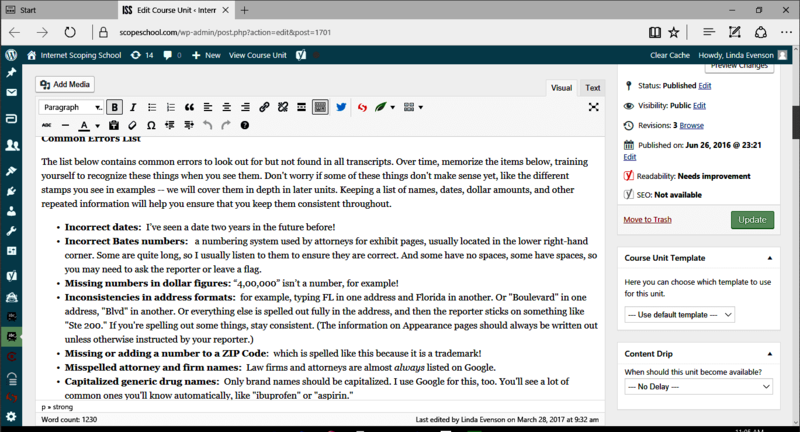 This innovation allows the reporter, scopist(s), and proofreader(s) to all be connected as the reporter writes the proceedings, allows them to exchange information, and corrections made by all are added to the file. ISS will be adding a lesson so that our graduates will know how to use this awesome new technology. New Section: The course is also adding a “Court Procedures” section that will cover information about working with official reporters (who report trials) and including one that is almost complete on Legal Terminology. Students receive lifetime access to unlimited email support. Linda says she prides herself on answering students’ questions. In her opinion, access to her time and expertise is part of what Internet Scoping School tuition pays for. Students also have lifetime access to a private Facebook group as well where students and graduates of Internet Scoping School share information, resources, and even job referrals. Technical support is also available as needed, and it is reported that technical issues are resolved in a timely manner. Better still, Linda has recently added the free AnyDesk service to the support repertoire. If you book an appointment, the instructor can access your computer to help you understand concepts within the training. They can also be on the phone while sharing computer screens to provide you with one-on-one instructions. This feature will be super helpful to students who are struggling with any concepts! It’s well worth noting that no other scoping training program offers this real-time assistance! It’s yet another reason ISS stands out over other courses! You have lifetime access to the course material, so your scoping education never ends! As things change or develop in the world of scoping, you will know about them. There are no pre-requisite educational qualifications. Those without any prior industry knowledge or experience begin with Scoping Fundamentals. Once that is successfully completed, the remaining Internet Scoping School modules teach you everything you need to know. A la carte prices on the modules are also available, but that is not the preferred method, as it will cost you more overall. It is only a good option if you already have a wide knowledge base in the industry. For those with substantial industry knowledge, test outs are available along with the possibility of taking an abbreviated version of the course. 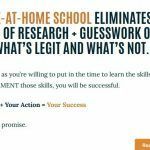 This course is the real deal for creating a professional, work-from-home career, for the right individual. For those who were considering a college degree and considering the idea of taking out debt to do it, it is an excellent alternative. It will take an investment of time and money, and it will require a big commitment to finish the coursework, which really is intensive and thorough. It appears to cover all the bases. When students successfully complete the course, they will be equipped to do the work and the marketing necessary to both find and keep clients. Keep in mind, a student will not be successful if they are not self-motivated. To succeed at scoping, you will have to be proactive about finding clients, especially in the beginning. Also, it takes time to build up your income, because how much you make per hour will depend on your speed, and increasing your speed will take time. You won’t want to count on making a substantial income right off the bat. However, if you follow through with the course and establish a base of clients that are happy with your work, you’ll have a referral-based business with the potential for a very nice work-from-home income. 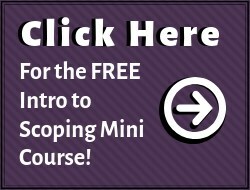 If you’re interested in pursuing scoping further, the free mini-course is a great place to start. Verdict: It provides a legitimate anywhere anytime career. For more information, check out this interview with course creator, Linda Evenson. 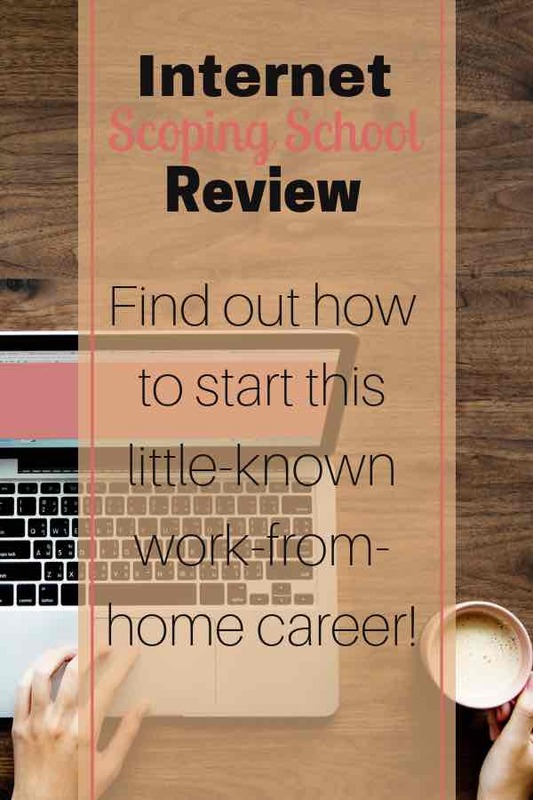 You’ll get a first-hand look into the world of scoping, learn how scoping might be a rewarding career that fits your busy life, and a glimpse of her sparkling personality. You can also check out our group interview with 3 scopist graduates of ISS who provide a glimpse of what it’s like to be a scopist! Last but not least, you can visit the Internet Scoping school website and check out their blog, features informative content written by both Linda and her students! As always, I’m happy to answer any question you may have, and comments are encouraged. If you have anything to share about scoping, I’d love to hear it. Let’s get a discussion going! I am interested, but I read in the article that we are required to have a high speed Internet. My present connection is a metered broadband, something like a prepaid Internet, but I see to it that it is always connected. With that be okay with this course? Another thing.. I’d like to ask about the mode of payment accepted. Do they accept credit card payments? Or do they let students pay via Paypal? By the way, I’m from the Philippines. Are they accepting international students like me? The reason you need high-speed internet is that the audio files that accompany the text run 14-16 mb/hr., so they are huge. Do you know what your download speed is? You can find out by going to speedtest.net. If your speed is slow, there are programs like Dropbox that you can use to transfer files instead. As long as your connection doesn’t drop, you should be able to get the work that way. ISS is set up to take credit card payments according to the payment plan you choose. 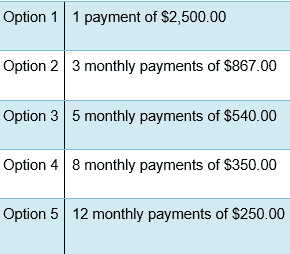 You can choose as many as 12 months of payments, with the provison that the training must be paid off by the time you graduate — for obvious reasons. You can also pay through PayPal or by check, if you prefer. The only thing I’d mention about nonAmerican students is that if English isn’t your first language, or if you are not very well versed in it, scoping is probably not a good career choice. Native “American English” speakers have their hands full, trying to figure out poorly spoken witnesses and attorneys. Years ago I trained some “foreign” students, and when I reviewed their work, they would sometimes have a totally wrong word in a sentence. It looked like it fit the steno notes, but it made no sense in the context of the transcript. That convinced me that nonnative speakers probably aren’t a good fit for scoping. However, Gomer, your comment is very well written and punctuated, so you may very well have the aptitude for words that is necessary to be a great scopist. In the free email series, there are two quizzes on word skills that would give you an idea if you are qualified for the training. I recommend that you sign up for them and see how you do on those drills. Feel free to discuss your score with me, and I will be honest with you about whether I think you have what it takes to be a professional scopist. I refuse to take anyone’s money and train them for a profession if I don’t think they will succeed. Thank you for your great questions! If you have more, feel free to post them. I have been scoping for over 38 years, and I have brought in hundreds of thousands of dollars for our family while working from home. I’ve always known I have the best of both worlds! You wrote a really awesome review! While this is not for me ( I tried a transcribing job from home once and I couldn’t pick out the tiny little words that people said quickly, and wanting to do the job well, I was frustrated to no end.) However, this seems like a great opportunity for people who are planning on going into this field anyway. 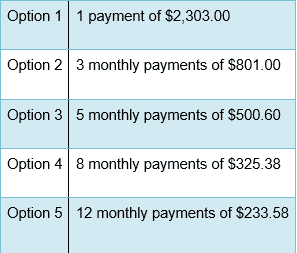 The pricing does seem a bit much for the program, and I would have liked to see what one could charge clients once a business is up and running. On the whole, I think it looks like a great course. Very happy that you thought the review was awesome, Christopher! That’s my aim. I put a lot of work into each review, interviewing the course creators, graduates, going through the course material (when I’m given access) and asking many questions all along the way! I’m going to leave answering your question to Linda as she will have more details to share than I would. Scoping is much easier and faster than transcribing. When a scopist receives a file from a reporter, it has been translated into English by the reporter’s computer. This is accomplished by matching the steno notes to words that the reporter has entered into his/her dictionary. If the word is not perfectly written or has not been entered into the dictionary, it may come up untranslated or mistranslated into the wrong words. I teach a thorough section on learning to read machine shorthand (steno) to help figure out these words. The reporter also sends an audio file by which we can spot check — or even listen to the whole audio — as we work. It’s a nice little “insurance policy.” The audio is usually very good quality, and we have the option of slowing it down to pick out words that we can’t hear. All online scopist training courses run about the same pricewise. Internet Scoping School, however, has two to three times the training material of the others. My goal was not to write a course that students could fly through; my goal was to write the most thorough course that I could so that students would be extraordinarily well prepared to get out there and do an amazing job for their clients. A satisfied client is one who keeps coming back, right? And ISS grads have the reputation of being some of the best in the field. Once a scopist builds his/her speed and clientele, it is very possible to make 35K or more, working from home — or even more, if you get into the rush market. Jobs that have less than a 3-day turnaround are uprated, sometimes by more than double. They are high stress but the pay can be over $500/day. They don’t come along very often — which is probably a good thing because they’re extremely exhausting — but just a few of them per year can really boost a scopist’s income. To qualify to edit them, however, one must be very experienced and fast while maintaining accuracy. They aren’t for novices. If you have more questions, please send them along. You might want to subscribe to the free email series to learn more about scoping and see if it’s something you might like better than transcribing. It’s a lot easier on the ol’ joints, since you aren’t typing in every word. To this day, I really enjoy what I do, and I’ve been scoping since God was a boy! It will provide my supplemental income long into my retirement. How can you beat that? Wow! This is such a comprehensive review of the school and the profession of scoping, which I have never heard of. It sounds like a great legitimate way to make money, but what about the school’s career services. Do they offer this? Do they offer to help you find clients after you complete the course? I would have to research the viability of the career. I just have never heard of it. I would hate to invest the money and time in this course and couldn’t find clients afterwards. You know what I mean. I checked out some of you other posts…Great website. We moms need this. I’m happy you found it useful, Shannon. I have to say that I’m learning a lot creating this website – I also had not heard of scoping until about 6 months ago. Apparently there is a definite need for scopists, but because they work in the background, we don’t hear about them much. ISS doesn’t offer jobs, but it does give comprehensive training on how to build your business and get clients. And as you have life-time access to the course and the accompanying Facebook group, you have plenty of support when you need it. Linda does post leads and reporter contacts in the FB group at times. Thanks for letting me know about these posts. I’m always delighted to talk about scoping. It’s been a wonderful career for me, and I highly recommend it. If you’re a “word nerd” like me, you can’t beat it! Isn’t it amazing that scoping has been around for about 40 years, and no one has ever heard of it? I think it’s because it’s a pretty specialized field. Unless you’re connected with court reporting, it’s probably a big mystery! ISS teaches our grads how to find clients, as well as passing on reporter contacts that we receive. We have been able to connect many grads to clients — sometimes before they officially graduate. Talk about being thrown in with the sharks! Since everyone is on the internet these days, it’s easier than ever to connect with reporters. I can tell you that sometimes, when I get swamped with work, I post a message on our private Facebook page, looking for help. Everyone is always too busy to help me! I mean, sheesh! That’s a great problem to have, but it would be nice if they’d help the ol’ teacher out. After all, I’ve been scoping since the dawn of creation, and I don’t WANT to work as much as I used to! If you go onto our website, there are several stories of ISS grads posted there. I can also tell you that, from what I see of our grads, once they graduate, they find clients and build successful businesses for themselves. I always tell them that if they’re looking for work, to let me know, and I rarely hear a peep. Court reporters just don’t have time to go out and write all day and then edit their own work and get it in in time. And if they find scopists who know do a great job on their transcripts, they want to keep them around. We have a public Facebook page located at https://www.facebook.com/groups/103946713273425/?ref=bookmarks. Anyone who is interested in scoping is welcome to join. You can interact with other potential students, current students, and grads. You can see what scoping is all about. And if you want to research the viability of the career, while on Facebook and search for “court reporters” and “scopists.” You will be amazed how many websites there are. There are even job boards where reporters and scopists advertise and make connections. It’s a great time to be a scopist! If you have any questions, shoot them on over. I love scoping and I highly recommend it!